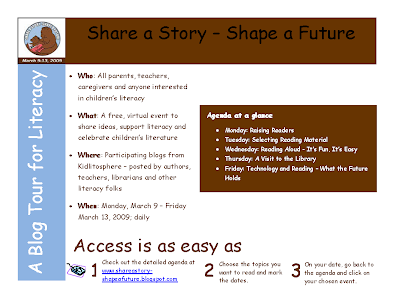 Please visit the Share a Story -- Shape a Future Blog Tour for Literacy this week for lively discussion and practical literacy-building tips. Just wanted to thank you for the value you added to my posts on Reading Aloud with your great comments, Candace. Susan, it was my pleasure to participate. Thanks for the thoughtful posts!